Once a sci-fi trope, iris recognition systems—which authenticate someone’s identity by measuring the coloured circle of their eye—are becoming an increasingly common form of biometric security. So researchers in Poland recently examined whether a machine learning system could distinguish a living eyeball from a dead one. Their method was able to consistently differentiate the two—but not if the eyeball belonged to the very recently dead. The researchers collected images from the Warsaw BioBase PostMortem Iris dataset, gathering 574 near-infrared iris images from 17 people who had died within five hours to 34 days. They also used 256 images of irises from living people. 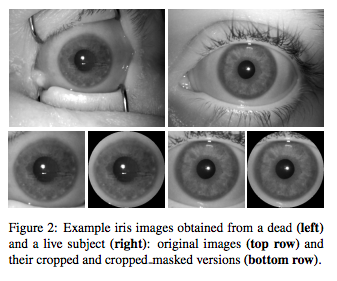 The team trained a deep neural network on this dataset to classify an image of an iris as taken either while the subject was alive or post-mortem. According to the paper, their method was ultimately able to correctly identify irises as dead or alive “nearly 99” per cent of the time, but struggled with freshly dead eyeballs.